I just discovered a unique home only a few blocks away from us. And I discovered it on a blog published halfway across the country. So amazing, this Internet thing. The house is a 3200-foot, 3 bedroom in Ranch Acres. It's one of those cool floorplans with two main wings that make a flying V. Inside it's full Zsa Zsa Colonial with harvest gold appliances and mysterious woodgrains. 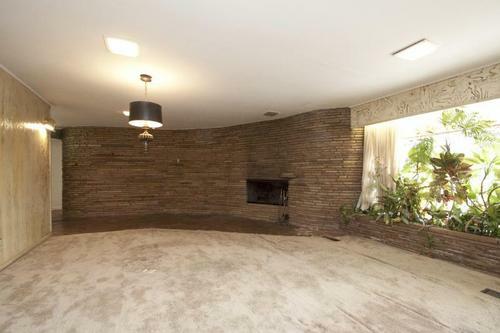 The fireplace set into the curved sandstone wall is also noteworthy. Let's hope an appreciative new owner saves this one from a Tuscan remuddle! Love the house you're in!